The HCA program is not offered at this current time. Join the community of committed Health Care professionals who provide care to those in need. This 30 week, full time program, will provide students with the knowledge and skills necessary to be employed as front-line care providers in care facilities or home-care settings. The course includes classroom theory, clinical instruction as well as supervised practicums in a variety of care facilities. Instruction is provided by qualified health professionals with extensive experience in the field of health care, both in clinical practice and teaching. The program delivered by Burnaby Community & Continuing Education (Burnaby School District) is recognized by the BC Care Aide & Community Health Worker Registry. The program uses approved HCA Provincial Curriculum 2018. Graduates of our program are eligible for registration with the BC Care Aide & Community Health Worker Registry. 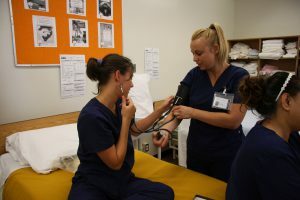 The Burnaby School District’s Health Care Assistant program has affiliation agreements in place with several Health Authorities in BC; this enables our school to request practicum placements in a variety of health care settings. Students are responsible for purchasing their own uniforms and shoes; requirements and costs will be discussed in class. Students must provide their own transportation to practicum sites. Students must register at least 1 full week before the program start date in order to secure a spot. Registration is only open for students who have completed the application requirements and have been officially accepted into the program. Interested applications can attend a free information session to discuss the application process and ensure they meet all the admission requirements. If you missed the information session please contact 604-296-6932 extension 663001. Over 95% of our graduates find employment within 6 months of graduating! Our graduates now work in such locations as Capilano Care Centre, Normana, Lynn Valley Care Centre, Eagle Ridge Hospital, Nikkei Assisted Living Home, Belvedere Care Centre, Cartier Home, Success Care Facility, Nurse Next Door and New Westminster Home Health. Students who successfully complete the program are eligible for registration with the BC Care Aide & Community Health Worker Registry. Graduates will be qualified to work in long term care facilities (complex care, special care, mental health), acute care facilities, community home support and in assisted living areas. The Health Care Assistant program and the variety of practicum experiences have opened up my eyes to a whole new field of opportunities for employment for HCAs. I recently took the HCA program and really enjoyed it. I learned a lot; it was really fun and even more important, I’m working full time now! For this program, registration is only accepted at Burnaby CCE Office and Burnaby Central Secondary during the hours listed below.